If Python is interpreted, what are .pyc files? I've been given to understand that Python is an interpreted language... However, when I look at my Python source code I see .pyc files, which Windows identifies as "Compiled Python Files". Where do these come in? They contain byte code, which is what the Python interpreter compiles the source to. This code is then executed by Python's virtual machine. Python is an interpreted language, as opposed to a compiled one, though the distinction can be blurry because of the presence of the bytecode compiler. This means that source files can be run directly without explicitly creating an executable which is then run. "The Bible" is "a book" in the sense of being a class of (actual, physical objects identified as) books; the books identified as "copies of the Bible" are supposed to have something fundamental in common (the contents, although even those can be in different languages, with different acceptable translations, levels of footnotes and other annotations) -- however, those books are perfectly well allowed to differ in a myriad of aspects that are not considered fundamental -- kind of binding, color of binding, font(s) used in the printing, illustrations if any, wide writable margins or not, numbers and kinds of builtin bookmarks, and so on, and so forth. It's quite possible that a typical printing of the Bible would indeed be in hardcover binding -- after all, it's a book that's typically meant to be read over and over, bookmarked at several places, thumbed through looking for given chapter-and-verse pointers, etc, etc, and a good hardcover binding can make a given copy last longer under such use. However, these are mundane (practical) issues that cannot be used to determine whether a given actual book object is a copy of the Bible or not: paperback printings are perfectly possible! Similarly, Python is "a language" in the sense of defining a class of language implementations which must all be similar in some fundamental respects (syntax, most semantics except those parts of those where they're explicitly allowed to differ) but are fully allowed to differ in just about every "implementation" detail -- including how they deal with the source files they're given, whether they compile the sources to some lower level forms (and, if so, which form -- and whether they save such compiled forms, to disk or elsewhere), how they execute said forms, and so forth. The classical implementation, CPython, is often called just "Python" for short -- but it's just one of several production-quality implementations, side by side with Microsoft's IronPython (which compiles to CLR codes, i.e., ".NET"), Jython (which compiles to JVM codes), PyPy (which is written in Python itself and can compile to a huge variety of "back-end" forms including "just-in-time" generated machine language). They're all Python (=="implementations of the Python language") just like many superficially different book objects can all be Bibles (=="copies of The Bible"). If you're interested in CPython specifically: it compiles the source files into a Python-specific lower-level form (known as "bytecode"), does so automatically when needed (when there is no bytecode file corresponding to a source file, or the bytecode file is older than the source or compiled by a different Python version), usually saves the bytecode files to disk (to avoid recompiling them in the future). OTOH IronPython will typically compile to CLR codes (saving them to disk or not, depending) and Jython to JVM codes (saving them to disk or not -- it will use the .class extension if it does save them). These lower level forms are then executed by appropriate "virtual machines" also known as "interpreters" -- the CPython VM, the .Net runtime, the Java VM (aka JVM), as appropriate. So, in this sense (what do typical implementations do), Python is an "interpreted language" if and only if C# and Java are: all of them have a typical implementation strategy of producing bytecode first, then executing it via a VM/interpreter. There is no such thing as an interpreted language. Whether an interpreter or a compiler is used is purely a trait of the implementation and has absolutely nothing whatsoever to do with the language. A language is just a set of abstract mathematical rules. An interpreter is one of several concrete implementation strategies for a language. Those two live on completely different abstraction levels. If English were a typed language, the term "interpreted language" would be a type error. The statement "Python is an interpreted language" is not just false (because being false would imply that the statement even makes sense, even if it is wrong), it just plain doesn't make sense, because a language can never be defined as "interpreted." IronPython: compiles to DLR trees which the DLR then compiles to CIL bytecode. What happens to the CIL bytecode depends upon which CLI VES you are running on, but Microsoft .NET, GNU Portable.NET and Novell Mono will eventually compile it to native machine code. Jython: interprets Python sourcecode until it identifies the hot code paths, which it then compiles to JVML bytecode. What happens to the JVML bytecode depends upon which JVM you are running on. Maxine will directly compile it to un-optimized native code until it identifies the hot code paths, which it then recompiles to optimized native code. HotSpot will first interpret the JVML bytecode and then eventually compile the hot code paths to optimized machine code. PyPy: compiles to PyPy bytecode, which then gets interpreted by the PyPy VM until it identifies the hot code paths which it then compiles into native code, JVML bytecode or CIL bytecode depending on which platform you are running on. CPython: compiles to CPython bytecode which it then interprets. Stackless Python: compiles to CPython bytecode which it then interprets. Unladen Swallow: compiles to CPython bytecode which it then interprets until it identifies the hot code paths which it then compiles to LLVM IR which the LLVM compiler then compiles to native machine code. You might notice that every single one of the implementations in that list (plus some others I didn't mention, like tinypy, Shedskin or Psyco) has a compiler. In fact, as far as I know, there is currently no Python implementation which is purely interpreted, there is no such implementation planned and there never has been such an implementation. Not only does the term "interpreted language" not make sense, even if you interpret it as meaning "language with interpreted implementation", it is clearly not true. Whoever told you that, obviously doesn't know what he is talking about. In particular, the .pyc files you are seeing are cached bytecode files produced by CPython, Stackless Python or Unladen Swallow. These are created by the Python interpreter when a .py file is imported, and they contain the "compiled bytecode" of the imported module/program, the idea being that the "translation" from source code to bytecode (which only needs to be done once) can be skipped on subsequent imports if the .pyc is newer than the corresponding .py file, thus speeding startup a little. But it's still interpreted. To speed up loading modules, Python caches the compiled content of modules in .pyc. CPython compiles its source code into "byte code", and for performance reasons, it caches this byte code on the file system whenever the source file has changes. This makes loading of Python modules much faster because the compilation phase can be bypassed. When your source file is foo.py , CPython caches the byte code in a foo.pyc file right next to the source. In python3, Python's import machinery is extended to write and search for byte code cache files in a single directory inside every Python package directory. This directory will be called __pycache__ . Python automatically compiles your script to compiled code, so called byte code, before running it. Running a script is not considered an import and no .pyc will be created. For example, if you have a script file abc.py that imports another module xyz.py, when you run abc.py, xyz.pyc will be created since xyz is imported, but no abc.pyc file will be created since abc.py isn’t being imported. If you need to create a .pyc file for a module that is not imported, you can use the py_compile and compileall modules. This will write the .pyc to the same location as abc.py (you can override that with the optional parameter cfile). You can also automatically compile all files in a directory or directories using the compileall module. Python (at least the most common implementation of it) follows a pattern of compiling the original source to byte codes, then interpreting the byte codes on a virtual machine. This means (again, the most common implementation) is neither a pure interpreter nor a pure compiler. The other side of this is, however, that the compilation process is mostly hidden -- the .pyc files are basically treated like a cache; they speed things up, but you normally don't have to be aware of them at all. It automatically invalidates and re-loads them (re-compiles the source code) when necessary based on file time/date stamps. Python's *.py file is just a text file in which you write some lines of code. When you try to execute this file using say "python filename.py"
This command invokes Python Virtual Machine. Python Virtual Machine has 2 components: "compiler" and "interpreter". Interpreter cannot directly read the text in *.py file, so this text is first converted into a byte code which is targeted to the PVM (not hardware but PVM). PVM executes this byte code. *.pyc file is also generated, as part of running it which performs your import operation on file in shell or in some other file. If this *.pyc file is already generated then every next time you run/execute your *.py file, system directly loads your *.pyc file which won't need any compilation(This will save you some machine cycles of processor). Once the *.pyc file is generated, there is no need of *.py file, unless you edit it. Python code goes through 2 stages. First step compiles the code into .pyc files which is actually a bytecode. Then this .pyc file(bytecode) is interpreted using CPython interpreter. Please refer to this link. Here process of code compilation and execution is explained in easy terms. Not the answer you're looking for? Browse other questions tagged python compiled interpreted-language pyc or ask your own question. Does the interpreter compile python scripts? So is python compiled before run? What will happen if I modify a Python script while it's running? Why are main runnable Python scripts not compiled to pyc files like modules? 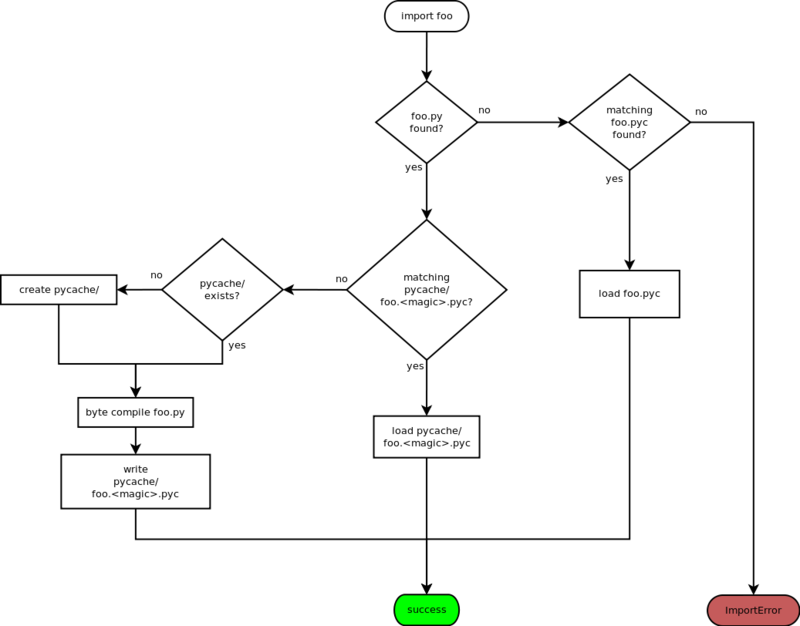 Should I put pyc files under version control? “All programs are interpreted”. How? What are motivations behind compiling to byte-code? is there any kind of performance gain while using .pyc files in python?